Joan Mullen was Joan Atkinson, a little girl almost 5 years old, when in 1946 her mother brought her third child, baby Bill, home from the hospital. She still remembers her initial disappointment. She had been hoping for a little sister because she already had a little brother. Her disappointment was only fleeting. Little Bill was absolutely lovable, and she became like a second mother to him. But it would not have occurred to her in a million years that she would live to see a cause for sainthood opened for him. 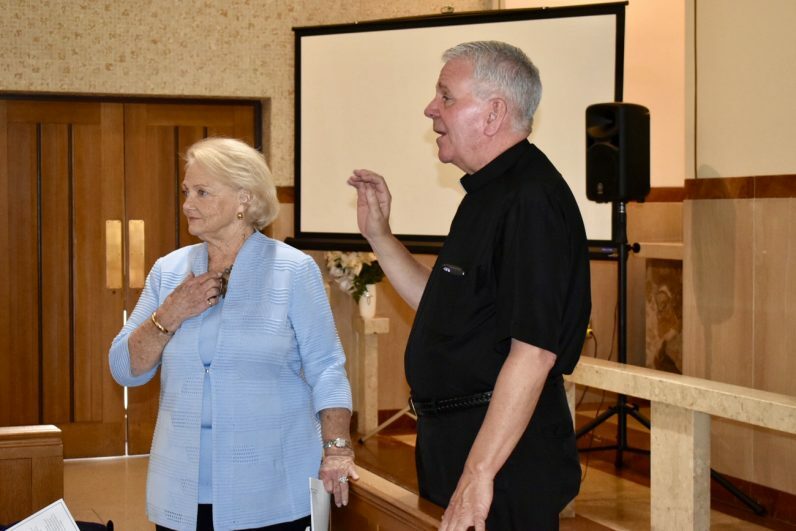 She told his story from a family perspective at a March 24 Lenten event at St. Katherine of Siena Parish in Northeast Philadelphia. The family, with Allen and Mary Atkinson as parents, lived in Upper Darby and ultimately grew to seven children. This was a golden age of Catholicism in America which now seems as distant as Camelot. In the Atkinson household there was Mass every Sunday and confession every Saturday, needed or not, and all of the sons were altar boys. At St. Alice School every grade was taught by an Immaculate Heart of Mary Sister, and no matter what, Sister was always right. “My mother never went down to the school to complain about anything,” she said. After St. Alice, Joan went on to West Catholic Girls High School, her sisters went to the new Archbishop Prendergast High and all the boys, including Bill, went to Msgr. Bonner High where they were taught by the Augustinian Fathers. Joan remembers her brother was very sports minded and athletic. Bill was especially fond of baseball and he probably had more trips to the emergency room for cuts and stitches than any of his siblings. He was also popular with the girls, which is why in spring of 1963, a time when she was planning her September wedding and he was graduating from Bonner, she was shocked when her mother told her he was planning to enter the Augustinians and study for the priesthood. “He never talked about himself and never told us. I guess our mother knew,” Joan said. Joan got married and Bill entered the Augustinians. During his first year, he was sent as a postulant to Augustinian Academy on Staten Island. During this time which was a trial for Bill, he could keep in touch by phone and there were also family visits to him. The second year, at Our Mother of Good Counsel Novitiate in New Hamburg, N.Y., it was a different story. Family visits were not permitted nor were telephone calls. “I guess he sent letters to our mother,” Joan said. It was on Feb. 22, 1965 when as recreation Bill and other seminarians were tobogganing when the unthinkable happened. The toboggan hit a tree and while the other seminarians were thrown into the snow unharmed, Bill, who was in front, was thrown directly into the tree. He was rushed to the hospital with a broken neck and collapsed lung and given little chance to live. But live he did, if at great cost. The accident left him a quadriplegic unable to use his arms or legs for the rest of his life. He had become totally dependent on others. After about six weeks in a hospital in Poughkeepsie he was brought down to Magee Rehabilitation in Philadelphia. 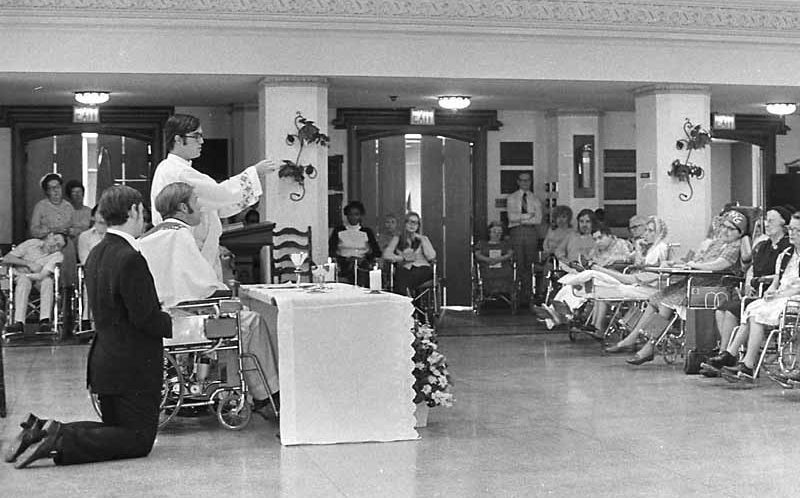 In September the Augustinians took him back for further rehabilitation at Villa St. Mary in Villanova. Joan remembers her brother went through an initial stage of anger and rage. In spite of his accident he was still determined to study for the priesthood. The Augustinians, despite his extensive disabilities, backed him on it. With special permission from Pope Paul VI, he was ordained a priest by Cardinal John Krol on Feb. 2, 1974. The next year he was assigned to the faculty of his alma mater, Msgr. Bonner High School, where he would teach for the next three decades. “He loved people and he loved to teach at Bonner,” his sister said. “He had the wonderful quality of being able to pick out a teenager who was on the wrong path, maybe having trouble at home. That was the boy he would ask to help him or to get him back on time or maybe drive him to the dentist. “These kids who were different would ask themselves, ‘Why me? Nobody asks me to do things.’ I think he did it to give them self-assurance. Some of these kids became doctors or nurses or accountants. We are talking about C and D track kids. They were impressed by his courage and patience. Father Atkinson, with failing health, retired from teaching in 2004 and he died Sept. 15, 2006. 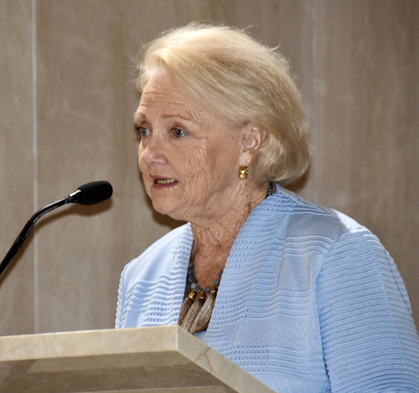 In August 2014, Joan along with other family members, friends and Augustinians were invited to an unusual meeting at Villanova. Among those present were Father Michael DiGregorio, the Augustinian prior provincial, and from Rome Father Josef Sciberras, postulator general for the Augustinians. The meeting, Joan discovered, was to decide whether a cause for canonization for her brother should be opened. 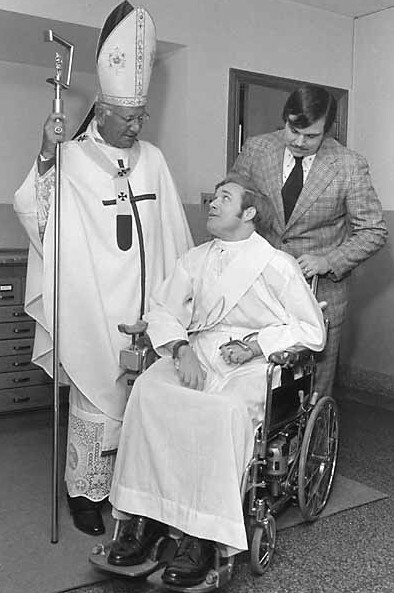 Simply being a quadriplegic, as heartbreaking as it may be, is not in itself grounds for being declared a saint. “Convince me Father Bill lived a life of heroic virtue,” Father Sciberras challenged the gathering. One by one those attending told of their encounters with Father Bill and why they believed he was saintly. “I’m convinced,” Father Sciberras said at the end. The cause of canonization for Father Bill Atkinson was formally opened in Philadelphia by Archbishop Charles Chaput in September 2015. Such causes (excepting recent popes) are usually very long, although St. Katharine Drexel’s came about in a relatively short time of 45 years after her death. Joan Mullen admits she well may not live long enough to see it happen. That doesn’t matter. In her heart she knows Bill Atkinson is already a saint.